ZOFFANY (IRE) (Bay 2008-Stud 2012). 5 wins at 2, Curragh Phoenix S., Gr.1. Leading GB/Ire. First Season Sire in 2015. Sire of 511 rnrs, 278 wnrs, 25 SW, inc. Ventura Storm (Milan Gran Premio del Jockey Club, Gr.1), Foundation, Illuminate, Fleeting, Knife Edge - Encounter (H.K. ), Waterloo Bridge - Senator (Sing. ), Zodiac Ruler, Washington DC, Main Edition, Who's Steph, Carzoff, Wilamina, Coral Beach, Dolce Strega, Crisaff's Queen, Hot Team, etc. MAYOTTE, by Encosta de Lago. Unplaced. Dam of one named foal. INDIAN OCEAN, by Danehill Dancer. 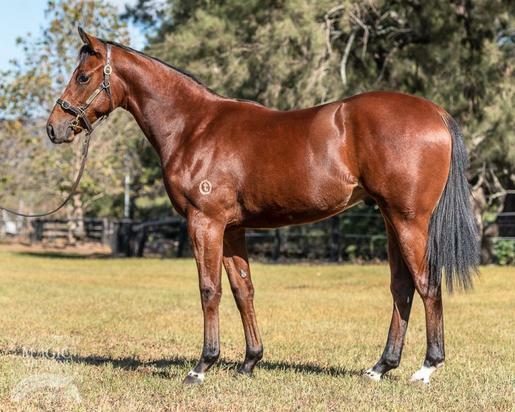 3 wins at 2, A$243,275, STC Magic Night S., Gr.2, Resmed Asia Pacific 2YO H., Rosehill Gardens Events 2YO H., 3d VRC Desirable S., L. Three-quarter-sister to LORNE DANCER. Dam of 3 foals, 2 to race. INDIAN OCEAN (Danehill Dancer). 3 wins. See above. Confrontation. Placed at 3 in Aust. Roxette. Winner at 1250m in Aust. LORNE DANCER (Danehill Dancer). 8 wins from 1200m to 2400m, A$391,320, AJC Craven P., Gr.3, City Tattersalls Club Cup, L, AJC Betting Auditorium H., Poplar Pet Foods H., STC Sportsman H., Madura H., 2d AJC International Passport H., Judyann 2YO H., STC IGA H., 3d AJC Tesa H., 4th ATC Randwick City S., Gr.3. Fast Fella. 5 wins from 1200m to 1650m, A$80,020, to 2017-18, Ipswich TC Schweppes P.
Miss Oklahoma. Winner at 1200m in 2017-18 in Aust. Inglewood. 3 wins at 1200m, 1400m, Avondale JC Cash 4 Scrap H., Rotorua RC The Catering Company H., 2d Avondale JC Mondiale Freight Services H., Taranaki RC Stars Travel H., 3d Rotorua RC Rydges H.
I Am Bacchus. 4 wins from 1200m to 1650m to 2017-18 in Aust. Metre Eater. 3 wins to 1400m to 2018-19 in Aust. Happy Time. 3 wins from 1300m to 1600m in Aust. Fab Cat. 2 wins at 1200m, 1300m in Aust. Zumba Magic. Winner at 1100m in Aust. Bailout Package. Winner at 1400m in Aust. Stan. 4 wins-1 at 2-from 1300m to 2150m, A$79,220, to 2017-18 in Aust. Fabled (Seattle Dancer). 3 wins. See above. Universal Glory. 2 wins at 1400m, 1800m, HK$2,098,420, HKJC Yun Ping H., Business Esolutions H., 2d HKJC International Jockeys' Championship H., Sapporo H., Lotus H., Shan King H., King Kwong H., Williams Cup H., Xian H., 3d HKJC Pedder H., Shackelton H., Jervois H., Mody H., Tai Ping Shan H., Cannon H.
Indian Sun. 8 wins at 1m, 9f in U.S.A.
Jurncalowe. 6 wins to 1400m in Aust. Danelen. 2 wins at 2 in South Africa. Will o' the Wisp. 3 wins to 1200m, 2d Taranaki RC Waterfront Hotel H.
Scar Tissue. 6 wins to 1200m in Aust. Flying Indy. 5 wins to 1200m in Aust. Strongly. 4 wins at 1300m, 1400m in Aust. Honour the Star. Winner at 1200m, 2d SAJC KPMG Business Advisory H., Amcor Fibre Packaging H.